The aim of this study was to assess and compare the outcome of mesh repair using Lichtenstein technique with tissue repair using Bassini technique in the treatment of incarcerated inguinal hernia. Placement of mesh in incarcerated hernia is presumed to increase the risk for infection. Tension-free repairs have gained popularity not only for primary or recurrent hernias but also for complicated inguinal hernia. Sixty patients with incarcerated inguinal hernia were enrolled. Patients were divided into two groups: group I, which underwent Lichtenstein hernioplasty, and group II, which underwent Bassini herniorraphy. Patients with recurrent or strangulated hernia were excluded from study. After preoperative assessment, all patients underwent herniotomy. In group I, a mesh was trimmed to fit the floor of the inguinal canal. In group II, the repair of the inguinal canal was performed upon two planes. Postoperatively, assessment of the hospital stay, surgical complications, and recurrence of hernia was carried out. No significant difference was found between groups as regards age, prevalence of smoking, the side, type, and duration of hernia, duration of irreducibility, clinical picture of hernia, usage of truss, method of anesthesia, content of hernia, and presence of postoperative complications. The operative time and the length of hospital stay were statistically significant between groups. Mesh repair is applicable in patients with incarcerated inguinal hernias with low morbidity rate. Significantly higher rates for mean length of hospital stay and mean length of operation and a higher rate for postoperative chronic pain were found in incarcerated inguinal hernia patients with Bassini repair. Groin hernias are among the most common problems encountered by surgeons and may have significant complications. Anterior abdominal wall hernia occurring with strangulation is a serious surgical emergency, as it is associated with high morbidity and mortality ,. It is generally agreed that a hernia should be electively repaired to avoid the complicated presentations . Using evidence-based medicine principles, several meta-analyses concluded that the use of mesh is superior to nonmesh operations in inguinal hernia surgery . The clinical results of tension-free anterior repair of inguinal hernia using a mesh revealed that the immediate complications were rare and always minor, and the rate of long-term recurrence is very low (0.5%) . In the event of incarcerated or strangulated hernias, however, placement of prosthetic material is presumed to increase that risk for infection . In recent years, the use of prosthetic material for inguinal hernia repair has increased dramatically. Tension-free repairs have gained popularity not only for primary or recurrent hernias but also for complicated inguinal hernia repairs. Inguinal hernia mesh repair according to Lichtenstein 'tension-free' technique has gained great acceptance worldwide, showing efficacy to consolidate the posterior wall of the inguinal canal and to reduce recurrence risk due to tension on suture lines and postoperative pain . The presence of a strangulated inguinal hernia cannot be considered a contraindication for the use of a prosthetic mesh. Lichtenstein hernioplasty can be successfully used not only as an elective operation but also as an emergency operation for incarcerated inguinal hernia with a good outcome and an acceptably low rate of postoperative complications, and the risk for local infectious complications is low [8–10]. However, the outcomes of emergency Lichtenstein hernioplasty were inferior to the outcomes of elective Lichtenstein hernioplasty . However, wound infection is a potential complication of all hernia repairs, and deep-seated infection involving an inserted mesh may result in chronic groin sepsis, which usually necessitates complete removal of mesh to produce resolution ,. The removal of mesh would potentially result in a weakness of the repair and subsequent hernia recurrence. However, hernia recurrence was found uncommon following mesh removal for chronic groin sepsis, suggesting that the strength of a mesh repair lies in the fibrous reaction evoked within the transversalis fascia by the prosthetic material rather than in the physical presence of the mesh itself. When there is established deep infection, there should be no unnecessary delay in removing an infected mesh to allow resolution of chronic groin sepsis . The aim of this study was to assess and compare the outcome of 'tension-free' mesh repair using Lichtenstein technique and Bassini technique used to treat incarcerated inguinal hernia with respect to hospital stays, postoperative morbidity, hematoma, pain, swelling, wound infection, and recurrence of hernia. The study protocol was approved by the ethical-committee of Menoufia university. A written consent was obtained from each participant. Sixty patients suffering from incarcerated inguinal hernia were enrolled for our study at the General Surgery Department, Menoufia University, from May 2015 to May 2016. Male patients who presented with incarcerated hernia and were above 18 years of age were included. Patients with recurrent hernia, strangulated hernia ended by means of resection and anastomosis of the intestine or with generalized peritonitis, or patients with ascites were excluded from the study. Preoperatively, all patients were carefully assessed by means of history taking, clinical examination, recording of comorbidities, and scoring according to American Society Of Anesthesiologists (ASA) grade. Resuscitation was performed first with intravenous fluids, blood transfusions, antibiotic prophylaxis including metronidazole, gastrointestinal decompression using Ryle's tube, and indwelling urinary catheter insertion. Laboratory and imaging investigations were performed. Time interval from acute onset to operation was determined. Selected patients provided written fully informed consent. They were randomized into two groups depending on whether the patient's registration number was odd or even. The study, however, was controlled so that mesh hernioplasty was not attempted in whom bowel resection was performed, and they were excluded from the study. Group I patients underwent open tension-free anterior repair utilizing a monofilament polypropylene mesh according to Lichtenstein 'tension-free' technique, whereas group II patients underwent Bassini technique. Intraoperatively, patients were placed in the supine position. The groin was prepared in the usual manner. Before the incision, a bolus dose of 1 g of third-generation cephalosporin injection was administered. After incising the skin, subcutaneous tissue, and external oblique aponeurosis, the spermatic cord was elevated from the posterior wall of the inguinal canal; thereafter, the hernial sac was identified, dissected to the internal ring, and opened to allow examination of its contents. If viable intestine was found, simple reduction was performed. If the content of the sac was omentum, resection was performed. The sac was ligated and its distal portion was usually excised. However, in large indirect inguinal hernias in which the sac descended down to the scrotum, the distal part of the sac was left open, thus allowing spontaneous obliteration. In group I, a polypropylene mesh was trimmed to fit the floor of the inguinal canal, and its apex was first sutured to the pubic tubercle using a Prolene 2-0 suture. Subsequently, interrupted sutures using the same thread were applied to the lower border of the mesh to the free edge of the inguinal ligament, after an opening was made into its lateral side to accommodate the spermatic cord. The interrupted sutures extended up just medial to the anterior superior iliac spine. Another interrupted Prolene suture was then applied to the two edges of the mesh together around the spermatic cord. The inferomedial corner of the mesh was then attached well overlapping the pubic tubercle. The mesh was then anchored to the conjoined tendon using same interrupted sutures. Meticulous hemostasis was performed during the whole operative step. In group II, the resection of the cremasteric muscle and an incision of the transversalis fascia from the deep inguinal ring to the pubic spine were necessary. The repair of the inguinal canal took place upon two planes. The deep layers were sutured using separate stitches (Prolene 2–0 sutures), 1 cm apart. The suture started from the pubis and medially included three layers – the internal oblique muscle, the aponeurosis of the transversus muscle, and transversalis fascia – and laterally included the iliopubic tract and the inguinal ligament. The suture reached deep ring, which was tightened so as to avoid compression of the cord vessels. The aponeurosis of external oblique was then closed by applying continuous absorbable sutures (Vicryl 2-0), and then closure of the wound in the anatomical order was performed. A drain was inserted extending down to the scrotum. Postoperatively, analgesia was administrated and all patients received a third-generation cephalosporin parenteral injection twice daily and metronidazole infusion three times daily for 2 days. Patients had outpatient follow-up visits for 3 months. Assessment of the hospital stay, surgical complications, and the recurrence of hernia was carried out. Data were collected and entered into the computer using statistical package for the social science program, version 13.0, for statistical analysis (SPSS; SPSS Inc., Chicago, Illinois, USA). Data were entered as numerical or categorical, as appropriate. Quantitative data were shown as mean, SD, and range. Qualitative data were expressed as frequency and percentage. Statistical analysis was performed using the χ2 (goodness-of-fit) test for qualitative data and one sample t-test for quantitative data. P value was considered to be of statistical significance if it was less than 0.01. In this study, 60 patients were enrolled in the final analysis. They were randomly assigned to two groups. In all, 30 patients were included in group I (the Lichtenstein tension-free hernioplasty group) and the other 30 were included into group II (the Bassini herniorrhaphy group). All patients included were male. Demographically, patients' ages ranged between 24 and 80 years in group I and between 20 and 84 years in group II, with no significant difference. Smoking was found in 25 patients (83.33%) in group I and in 24 (80%) patients in group II, with a nonsignificant difference. As regards health status evaluation of patients using ASA classification, there was no significant statistical difference between the two groups. It showed nearly equal results in all ASA classes when compared with each other [Table 1]. As regards hernia, it was found on the right side in 66.67% of patients in group I and in 60% of patients in group II, whereas the rest of the patients had inguinal hernia on the left side. All patients who had bilateral or recurrent inguinal hernias were excluded from the study. Concerning duration of hernia, it ranged between 6 and 66 months in group I, whereas it ranged between 2 and 60 months in group II. However, the duration of irreducibility was less than 1 day in most patients with nonsignificant statistical difference between the two groups. Both groups showed a nonsignificant difference as regards signs and symptoms of their inguinal hernia during acute incarceration. The presence of medical conditions associated with weak abdominal wall (weak mesenchyme syndrome) as one of the etiological factors of inguinal hernia had no statistically significant difference. There was no statistical significance as regards the usage of truss as the cause of incarceration [Table 2]. As regards the perioperative data, 54 (90%) patients had spinal anesthesia and only six (10%) patients had general anesthesia with no significant difference. The type of anesthesia was chosen according to the patient's medical condition determined by the anesthetist. Indirect type of inguinal hernia was found in 53 (83%) patients with a nonsignificant difference. According to the Nyhus classification , type I and type II were found in 14 patients each, with no statistically significant difference. On comparing the main content of incarcerated inguinal hernia, there was no significant statistical difference. It showed nearly equal distribution between a part of the greater omentum and loops of the small intestine, with a small proportion for a part of the sigmoid colon. As regards the operative time, group II showed more mean operative time compared with the Lichtenstein group with significant statistical difference (P = 0.039). Concerning the length of hospital stay, there was no significant difference between mean, but a significant statistical difference (P = 0.03) was found after categorizing the patients into two groups according to the hospital stay, if it was 1 day or more. Totally, 25 (83%) patients in group II and 17 (57%) patients in group I had postoperative stay more than 1 day. Totally, 23 (77%) patients in group I and 20 (67%) patients in group II had no postoperative complication at all. No difference was found in postoperative local wound infection between the two groups, which was one of the purposes of the study [Table 3]. There was a common doubt about the application of the synthetic mesh in emergency surgery for incarcerated and strangulated hernias because of the possibility of surgical field infection. Surgeons were worried about infection-related problems that could occur because of possible bacterial translocation in the presence of intestinal obstruction . Elsebae et al. reported that the use of Lichtenstein 'tension-free' technique in the emergency treatment of strangulated inguinal hernia is safe and effective with an acceptably low rate of postoperative complications and without recurrence. Derici et al. reported that mesh repair can be preferred in incarcerated inguinal hernia patients because the recurrence rate was significantly lower in patients who underwent Lichtenstein repair, regardless of the presence of gangrenous bowel loops. Moreover, Lohsiriwat et al. mentioned that Lichtenstein hernioplasty can be used effectively as an emergency operation for incarcerated inguinal hernia with a good outcome and an acceptably low rate of postoperative complications. Our study aimed to compare Lichtenstein tension-free hernioplasty with Bassini herniorrhaphy in managing acutely incarcerated inguinal hernia. The primary concern was to compare the postoperative rate of local wound infection between the two techniques. It also aimed to compare the mean operative time, postoperative hospital stay, and other postoperative complications. It was conducted as a prospective single-blinded randomized clinical trial. Sixty patients were enrolled in the final analysis. All patients included were male. They were randomly assigned to two groups. Thirty patients were included in group I (the Lichtenstein tension-free hernioplasty group) and the other 30 were included in group II (the Bassini herniorrhaphy group). All demographic data of the patients in our study compared in both groups nearly had no differences. The age of patients treated with Lichtenstein hernioplasty ranged between 24 and 80 years with a mean age of 51.07 years (the sixth decade). However, in patients treated with Bassini herniorrhaphy it ranged between 20 and 84 years with a mean age of 53.77 years. Similar results were found in the study by Lohsiriwat et al. , who reported a mean age of 53.8 ± 19.2 years (range: 19–77 years). It was a descriptive study concerning the use of Lichtenstein in acute incarceration of inguinal hernia. Other studies such as those by Derici et al. and Papaziogas et al. reported an older mean age for patients (seventh and eighth decades). In the study by Derici et al. , the mean age of patients who received Liechtenstein hernioplasty (group I) was 69.4 + 14.1 (n = 29), whereas it was 52.1 + 22.7 (n = 102) in patients who received Bassini herniorrhaphy (group II). Patients in group I were significantly older than those in group II (P = 0.005). This difference found in the study by Derici and colleagues may be attributed to the fact that it was not a single-blinded randomized study with unequal study groups. All patients in our study were male. This was found in the study by Lohsiriwat  as all patients (n = 24) were male. Other studies had both sexes, such as the studies by Derici et al. and Papaziogas et al. . This difference had no great importance as it did not interfere with the result value. Most of the patients in our study were smokers in both groups. An overall 83.33% (N = 25) of patients in the Lichtenstein group were smokers, whereas 80% (N = 24) of patients in the Bassini group were smokers with a nonsignificant difference (P = 1). Concerning health status evaluation of patients through ASA classification, it showed nearly equal results in all ASA classes when compared with each other in our study (P = 0.948). This was also mentioned in all studies with similar aims ,,,. Our study showed that most of the patients had inguinal hernia situated on the right side. The percentage of patients who had inguinal hernia on the right side was 66.67% in group I and 60% in group II; the rest of the patients had inguinal hernia on the left side (P = 0.789). This was found in the study by Lohsiriwat and others, as 66.7% of patients had inguinal hernia situated on the right side. As regards duration of hernia in study patients treated with Lichtenstein hernioplasty in our study, it ranged between 6 and 66 months, whereas it ranged between 2 and 60 months in patients treated with Bassini herniorrhaphy. Indirect type of inguinal hernia was found in our study in most patients in both groups. The incidence was 93.33% (N = 28) in the Lichtenstein group, whereas it was 83.33% (N = 25) in the Bassini group with a nonsignificant (P = 0.424). Similar findings were reported by Papaziogas , who reported that indirect type of inguinal hernia was present in 84.8% (N = 33) of patients in the Lichtenstein group and in 83.3% (N = 42) of patients in the Bassini group. There was no significant difference between the two groups as regards the mean duration of hernia (24.6 vs. 25.5 months, P = 0.478). A similar result was reported by Lohsiriwat et al. , who reported a mean duration of 21.9 ± 40.1 months. Most of the patients in our study had incarcerated hernia for less than 1 day (66.67 vs. 63.33%, P = 1). Signs and symptoms of hernia in the patients compared between the two groups showed a nonsignificant difference. As regards possible causes of hernia, such as weak mesenchyme syndrome, the study showed no differences on comparing the two groups. Truss usage in hernia patients plays an important role in hernia incarceration. Most of the patients did not use, resulting in similar results in both groups [83.33% (N = 25) vs. 76.67% (N = 23), P = 0.748]. All previous section results in our study had no significant statistical differences or even similar results. This is very important, as these results if they had significant differences would render the rest results unreliable or have weak importance. As regards perioperative data, most of the patients had spinal anesthesia and only a small proportion had general anesthesia. No significant difference between the two groups was found [93.33% (N = 28) vs. 86.67% (N = 26), P = 0.671]. The type of anesthesia was chosen according to the patient's medical condition determined by the anesthetist; it did not affect the significance of the study because the results were similar. Similarly, it was mentioned in the study by Derici et al. 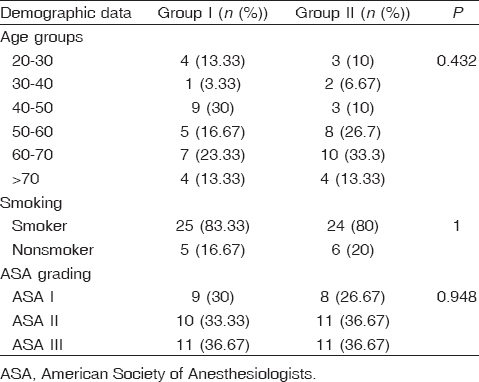 that most of the patients needed spinal anesthesia [group I (n = 29) 86.2% vs. group II (n = 102) 74.5%). In contrast, Lohsiriwat et al. used general anesthesia in all study patients as they thought that incarcerated hernias are more appropriately repaired with the patient under general anesthesia because of the nature of the visceral involvement. On comparing the main content of incarcerated inguinal hernia, there was no significant statistical difference (P = 0.966). It showed nearly equal distribution between the distribution of a part of the greater omentum and loops of the small intestine, with a small proportion for a part of the sigmoid colon. In the study by Lohsiriwat et al. 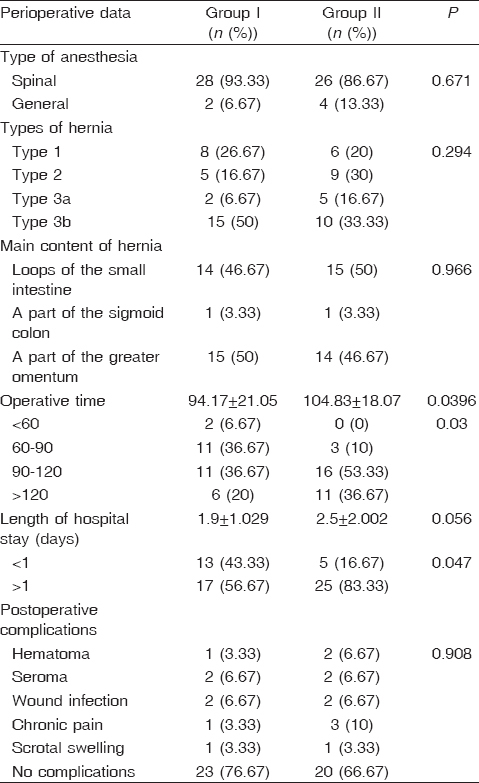 , the contents of the incarcerated hernia were omentum in 12 (50%) patients, a loop of small bowel in 10 (41.7%) patients, and the sigmoid colon in two (8.3%) patients. These study results are similar to our study results. Our study mentioned that the mean operative time was significantly longer in group II (104.83 ± 18.07 vs. 94.17 ± 21.05 min) (P = 0.0396). Similar results were found in the study by Papaziogas  (91.5 ± 9.3 vs. 75.7 ± 10.5 min) (P < 0.05). Derici et al. reported nearly equal surgery time (70 ± 17.3 vs. 70.7 ± 12.3 min) (P = 0.814). The results reported by Derici had weak importance as it was not randomized or single blinded as our study, and hence our result was more reliable. Moreover, a significant difference was found in our study after categorizing time of surgery. In group I, 11 patients had surgery time ranging from 60 to 90 min, but in group II 16 patients had longer surgery time (from 90 to 120 min) with a significant P value of 0.03. Concerning the mean duration of hospital stay among patients in our study in both groups, it was longer in group II (2.5 ± 2.002 vs. 1.9 ± 1.029 days), but with a nonsignificant difference (P = 0.056). However, after categorizing the hospitalization period, a significant difference was found in patients who had postoperative stay more than 1 day with longer period in group II [83.33% (N = 25) vs. 56.67% (N = 17), P = 0.047]. This was found in the study by Elsebae  with significant difference (5 ± 3.4 vs. 3 ± 2.1 days, P < 0.01) and in the study by Papaziogas (10.3 ± 3.4 vs. 4.5 ± 2.1, P < 0.01), which confirmed our result. As regards complications after surgery, our study found that there was no significant difference between the two groups. Most of the patients in both groups had no postoperative complication at all [76.67% (N = 23) vs. 66.67% (N = 20), P = 0.908]. No difference was found in postoperative local wound infection between the two groups. There were only two patients in each group with superficial wound infection that needed only medical treatment after drainage to manage it. Similar findings were reported in the studies by Elsebae et al. , Papaziogas et al. [five (15.1%) vs. five (15.1%)], and Derici [eight (27.6) vs. 20 (19.6), P = 0.247]. Other local short-term complications included seroma, hematoma, scrotal swelling, and chronic inguinal pain [16.7% (N = 5) vs. 26.7% (N = 8), P = 0.908]. All showed a nonsignificant difference between the two groups and needed medications for cure in few weeks. No recurrence occurred during the period of study and long-term follow-up was required to detect the efficacy of mesh in complicated hernia. Elsebae et al. , Papaziogas et al. , Lohsiriwat et al. , and Derici et al. mentioned that there were variable periods for follow-up and they found great difference as regards recurrence between patients who underwent Bassini operation and patients who underwent Lichtenstein operation. They found much less or even no recurrence in patients who received Liechtenstein hernioplasty. They also found that all other postoperative complications did not need removal of the mesh. As former studies confirmed the usage of mesh in the presence of acute incarceration in inguinal hernias, we confirmed that there was no fear of infection with the usage of mesh and this was the cornerstone to reduce recurrence after inguinal hernia repairs. Mesh repair is applicable in patients with incarcerated inguinal hernias with low morbidity rate. Significantly higher rates for mean length of hospital stay and mean length of operation and a higher rate for postoperative chronic pain were found in incarcerated inguinal hernia patients who underwent Bassini repair. Papaziogas B, Lazaridis C, Makris J, Koutelidakis J, Patsas A, Grigoriou M, et al. Tension-free repair versus modified Bassini technique (Andrews's technique) for strangulated inguinal hernia: a comparative study. Hernia 2005; 9:156–159. Pavlidis T, Atmatzidis K, Lazaridis C, Papaziogas B, Makris J, Papaziogas T. Comparison between modern mesh and conventional non-mesh methods of inguinal hernia repair. Minerva Chir 2002; 57:7–12. Fitzgibbons R. Management of an inguinal hernia: conventional? Tension-free? Laparoscopic? Or may be no treatment at all. General sessions of the American college of surgeons. 86th Annual Clinical Congress: Chicago, USA; 2000. Mauch J, Helbling C, Schlumpf R. Incarcerated and strangulated hernias: surgical approach and management. Swiss Surg 2000; 6:28–31. Kingsnorth A. Hernia surgery: from guidelines to clinical practice. Ann R Coll Surg Engl 2009; 91:273–279. Awad S, Fagan S. Current approaches to inguinal hernia repair. Am J Surg 2004; 188 (6A Suppl):9S–16S. Lau W. History of treatment of groin hernia. World J Surg 2002; 26:748–759. Earle D, Mark L. Prosthetic material in inguinal hernia repair: how do I choose? Surg Clin North Am 2008; 88:179–201. Bay-Nielsen M, Thomsen H, Andersen F, Bendix J, Sørensen O, Skovgaard N, et al. Convalescence after inguinal herniorrhaphy. Br J Surg 2004; 91:362–367. Gilbert A, Graham M. Technical and scientific objections to laparoscopic herniorrhaphy: problems in surgery. Vol. 12. Philadelphia, USA: Lippincott Raven. 1995.p. 2. Lichtenstein IL. Hernia repair without disability. Saint Louis: The C.V. Mosby Company; 1970. pp. 1–8. Derici H, Unalp H, Nazli O, Kamer E, Coskun M, Tansug T et al. Prosthetic repair of incarcerated inguinal hernias: is it reliable method? Langenbecks Arch Surg 2010; 395:575–579. Nyhus L. The posterior (prepretoneal) approach and ilio-pupic tract repair of inguinal and femoral hernias: an update. 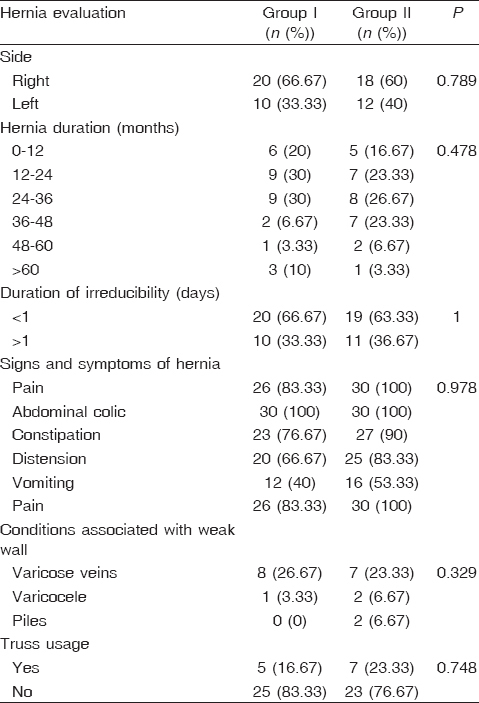 Hernia 2003; 7:63–67. Holzheimer R Inguinal hernia: classification, diagnosis and treatment classic, traumatic and Sportsman's hernia. Eur J Med Res 2005; 10:121–134. Zieren J, Zieren H, Jacobi C, Wenger F, Muller J. Prospective randomized study comparing laparoscopic and open tension-free inguinal hernia repair with Shouldice's operation. Am J Surg 1998; 175:330–333. Elsebae M, Nasr M, Said M. Tension-free repair versus Bassini technique for strangulated inguinal hernia: a controlled randomized study. Int J Surg 2008; 6:302–305. Lohsiriwat V, Sridermma W, Akaraviputh T, Boonnuch W, Chinsawangwatthanakol V, Methasate A, et al. Surgical outcomes of Lichtenstein tension-free hernioplasty for acutely incarcerated inguinal hernia. Surg Today 2007; 37:212–214.